Rónán Ó hÓgartaigh, Moltóir Ghradam Sheosaimh Uí Ógartaigh 2019, Aelmuire Ní Ógartaigh and an t-Ollamh Ciarán Ó hÓgartaigh, Uachtarán Ollscoil na hÉireann, Gaillimh at the Launch of Gradam Sheosaimh Uí Ógartaigh 2019 which took place in the Connacht Hotel this week. The spirit of 2019 being UNESCO Year of Indigenous Languages was evoked by the Cathaoirleach of Gaillimh le Gaeilge when she spoke at the launch of Gradam Sheosaimh Uí Ógartaigh 2019 at an event in the Connacht Hotel on Tuesday. Bernadette Mullarkey told the gathering that the message to any business or organisation who is considering entering Gradam Sheosaimh Uí Ógartaigh this year is to evoke the UNESCO year of Indigenous Languages, téigh ar aghaidh agus tabhair faoi and go for it. “Participants in the Gradam are key to Galway’s bilingual future which is important in the lead up to our year as European Capital of Culture. “Your work will ensure that visitors and locals alike, enjoy a truly unique cultural experience here in our city,” she said. The Gradam, Galway’s bilingual business award, was officially launched by the Mayor of the City of Galway, Cllr. Níall McNelis and is now open for nominations to businesses and organisations based in Galway city until Friday the 22nd of February. Gaillimh le Gaeilge was delighted to welcome on board a new sponsor, MOLSCÉAL, for Gradam Sheosaimh Uí Ógartaigh 2019. Developed by TG4,MOLSCÉAL is the first ever app that provides short form video content for the Irish language speaking community all in one place. Gradam Sheosaimh Uí Ógartaigh will feature on the app over the coming months. “It is fantastic to see a new sponsor supporting Gradam Sheosaimh Uí Ógartaigh, bringing with them a new energy so that you’ll continue to develop and grow, but I also think it’s equally important that you keep your current sponsors. “The Galway Advertiser is the Gradam’s main supporter, so with the highest circulating local newspaper in the country backing you, it’s no surprise that the Gradam is such a success,” he said. I’m also delighted that TG4 are back on board for 2019, as well as all of the category sponsors;Galway Bay FM - the Retail Category; Fáilte Ireland - the Tourism and Hospitality Category; Snap Galway - the Services Category and Acadamh na hOllscolaíochta Gaeilge,OÉ Gaillimh - the Other Companies Category. The Gradam has a strong list of sponsors with a great business package worth over €23,000 - comhghairdeas libh,” he said. Mayor McNelis announced Údarás na Gaeltachta as sponsors of the miniature versions of the Gradam which will be presented to the category winners as well as the Galway Chamber who will provide sponsorship to the overall winner. Gradam Sheosaimh Uí Ógartaigh, is now in its 17th year and has attracted many well-known Galway businesses over the years. Businesses and organisations based in Galway city who are using ‘an Ghaeilge’ in their day to day business, can now enter online and free of charge at www.gleg.ie You can nominate your own business or organisation and you can also nominate another business or organisation that use the Irish language in the city. 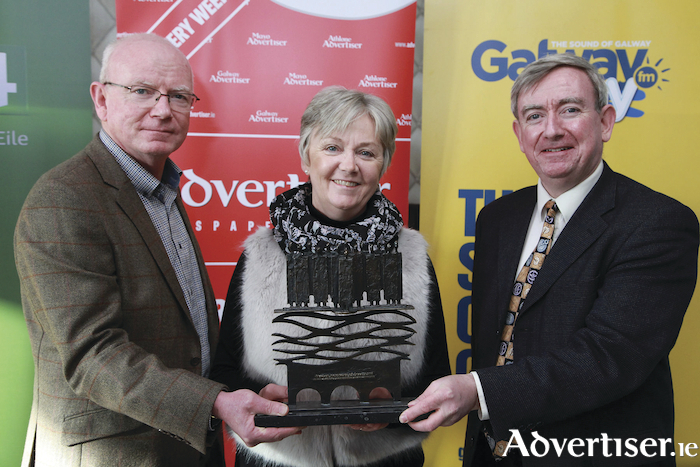 Declan Varley, Group Editor of the Galway Advertiser addressed the gathering and said that the Galway Advertiser is delighted to be associated with the awards because it blends with the newspaper’s ethos of accentuating the positive about all things Galway. “By highlighting the magic of the Irish language, Gaillimh le Gaeilge have made Galway different. They add to the mixture. Galway is one big melting pot of difference and it is the juxtaposition of all these languages, ambitions and outlooks, that makes it great. “The Galway Advertiser is delighted to continue supporting this campaign to keep Galway different and fresh, not just this year but long into the future. Being different is key to the future of Galway — the decisions that are made in the city over the next ten years will shape Galway for the next century,” he added. Gaillimh le Gaeilge is currently putting a schedule and wishes to meet with businesses and organisations who are interested in using the Irish language to create a bilingual business. The closing date for Gradam entries is Friday February 22. Gaillimh le Gaeilhe will examine various possibilities in terms of the use of Irish in your business or organisation and you have over 10 weeks to prepare for the adjudication which will take place in mid-April.